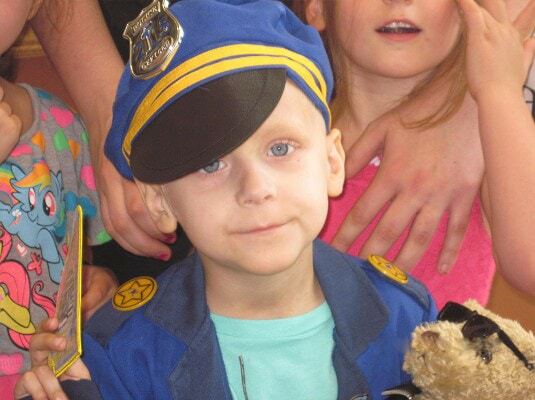 On August 12, 2016, Cops For Kids With Cancer went to the Gardner Police Department and made a $5,000 donation to the family of Gabriel Cronin, a 5 year old boy from Gardner who has Ewings Sarcoma. In photo left to right, Officer Kolimage, dispatcher Newton Lieut. Det, MSP, Bill Coulter, CFKWC, Mother Rachel Davis and her children, Haylie, Lily and Gabe, Bob Faherty (retired CFKWC Chairman), Officer Ryan Coates, and Deputy Chief John Bernard.